Department 56 began in 1976 as part of Bachman’s, a retail floral company, that used a numbering system to identify each of its departments. The name assigned to the Wholesale Gift Imports Division was Department 56. 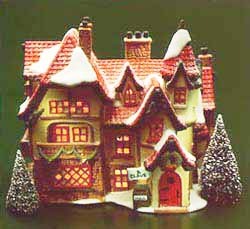 Now headquartered in Eden Prairie, MN, Department 56 has become a leading designer, importer and distributor of collectibles and giftware known for its handcrafted, lighted Villages, SnowbabiesTM figurines and extensive lines of holiday and home decorative products. 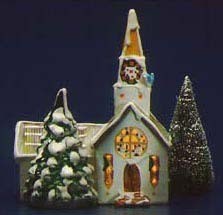 The first Department 56 introductions were six charming ceramic, lighted buildings that represented the beginning of The Original Snow Village®. This original series was retired in 1979 to make way for 12 new models as well as the appearance of the first Village accessory. Pictured left is the Steepled Church, one of the original six buildings which was introduced in 1976 and retired in 1979. Subsequent series introduced have included: The Heritage Village Collection® in 1984 which included The Dickens’ Village Series® and later in 1986, The New England Village® Series and The Alpine Village Series® were added. The year also saw the the release of the ever popular SnowbabiesTM. 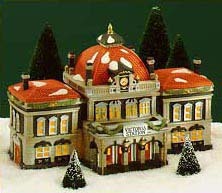 Pictured right is Victoria Station (from The Dickens’ Village Series®) which was introduced in 1989 and retired in 1998. In 1987, The Heritage Village Collection was expanded with the addition of the busy sidewalks of Christmas In The City® and the inspiring Little Town Of BethlehemTM. In 1990, The Legend of Santa Claus becomes a part of Department 56 tradition with the addition of The North Pole SeriesTM to The Heritage Village Collection. 1994 saw the introduction of The Disney Parks Village SeriesTM and Snowbunnies®. Pictured left is Santa’s Workshop (from The North Pole SeriesTM) which was introduced in 1990 and retired in 1993.